It is a truth universally acknowledged that a teenage nephew in want of money will be willing to muck out a goat barn. Thankfully, this was the case today. Following of the “deep bedding” methodology, we don’t clean out the goat barn often. We layer new hay on top of old and the goats seem to do quite well with this arrangement. However, it does become necessary, at least once a year, to really clean the whole thing out. The best solution to this problem is to find some motivated labor to tackle the job. Once cleaned out of the barn, the muck is composted and then later use in garden beds. Thanks Ryan! Continuing on the theme of muck and yuck, Lily and Andrew made a stream, dam, and lake today. They busied themselves with this project during a period of benign parental neglect while I weeded a nearby section of the yard. The weather was warm (60 something) and they were having fun, so it worked out all around. They were dirty by the end. I mean really, really dirty, but they went straight into the bath with no complaints. Another yuck for today. I pruned the rose bushes. There’s nothing fun about this task and it is inevitable that I’ll draw blood at some point. But it was necessary and at least the rose clippings provided a good distraction for the goats while Ryan was mucking the barn. 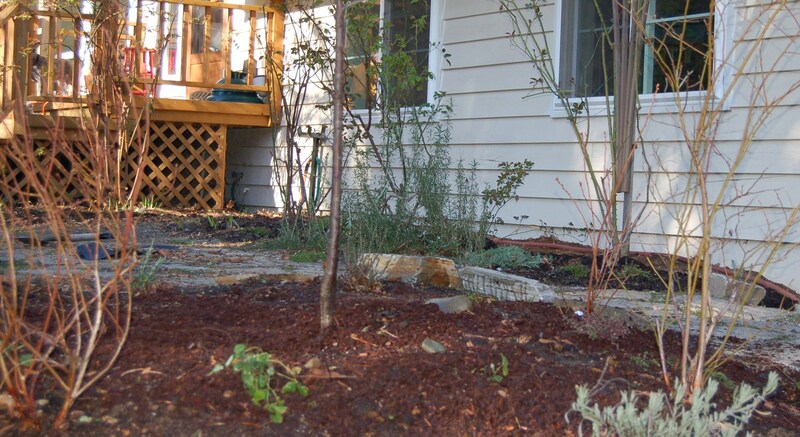 In addition to pruning the roses, I weeded two sections of the front yard: the rose border and a planting area with the dwarf cherry tree and blueberry bushes. The latter area also has lavender, rosemary, thyme, and alpine strawberry plants. I’ve been dividing my alpine strawberries from around the yard (I have several patches now) and moved some over to this new planting area. The only seeds I put in the ground today were some Eckford’s Finest sweet peas. I pre-sprouted these a few days ago, planted them with some manure, and am hoping they do really well since they are supposed to be really fragrant. Whew! It was a busy day. With all of the above going on, I wasn’t able to do any real food gardening today. No matter. The weather is going to be great tomorrow and I will be taking the day off to celebrate my birthday. I think I’ll do some pea planting. Here’s to such a beautiful weekend! P.S. In my last post I mentioned that Lily has been wanting to set up an egg stand. We set up the stand today. She had 30 eggs to sell ($0.25 each) and she sold out within 15 minutes. It was a big success! I see more egg stands in our future this spring and summer. This entry was posted in Gardening, Livestock and tagged barns, goats, mucking, roses, sweet peas. Bookmark the permalink. Happy Birthday Sandy! The weather is supposed to be wonderful again tomorrow – just perfect for your birthday “day off”! Enjoy! Hurrah for Lily with the great egg sales. Wow! Looks like everyone had a good day in the sunshine today (well maybe not Ryan with the goat barn cleaning! ).